SANAA, Yemen - Fighting between troops loyal to Yemen's embattled leader and rival forces on Monday killed at least 18 people, including eight supporters of a powerful tribal chief who defected to the opposition in March. The pre-dawn fighting, the worst in the capital Sanaa in weeks, has revived fears of civil war in the strategically located nation on the southern corner of the Arabian Peninsula. Mortars, rockets and heavy machine-guns were used in the hours-long battle in the northern sector of the city close to the international airport. A series of blasts shook the city for hours, forcing residents in many parts to take shelter in basements. The fighting continued throughout the night, briefly stopped for the dawn prayers and then resumed. It ceased by sunrise. Many of the city's stores were shuttered on Monday in anticipation of renewed fighting, but the day passed without any major violence. However, traffic was lighter than usual and residents hurried home before sunset. The fighting has deepened fears that Yemen, the Arab world's poorest nation, is headed for civil war, a grim prospect for the nation's conflict-fatigued 23 million people. Firearms have traditionally been readily available in Yemen, where owning a rifle is a rite of passage for most young males. Many Yemenis also have military experience from serving in the army and fighting in the nation's many domestic wars. With central authority ranging from weak to nonexistent outside Sanaa, it is not uncommon for tribesmen to have heavy machine-guns, anti-aircraft guns, mortars and rocket propelled grenades. Saleh is accused by many Yemenis of pushing the country into civil war by tenaciously clinging to power in the face of eight months of massive protests across the country, the defection to the opposition of key tribal and military allies and mounting international pressure on him to step down. He has so far balked at a U.S.-backed plan proposed by Saudi Arabia and its five smaller allies in the Gulf Cooperation Council to hand over power to his deputy and step down in exchange for immunity. A civil war would significantly hurt efforts by Washington and Riyadh to fight Yemen's dangerous al Qaeda branch and could turn the mountainous nation into a global haven for militants just a short distance away from the vast oil fields of the Gulf and the key shipping lanes in the Arabian and Red seas going to and coming from the Suez Canal. "All signs suggest that we are headed toward civil war if things continue down this path," said Tawfeeq al-Sanabani, a university lecturer and a political activist. "People don't want it and we are praying that something will alter the equation and we don't have one." Already, the city is dissected into sectors under the control of three forces: pro-government troops, renegade soldiers from the 1st Armored Division and tribal gunmen. Many streets are deemed too dangerous to go into either because rival forces are deployed at close proximity or because of snipers. Checkpoints staffed by armed men from all three factions have multiplied over the months. The city, home to an estimated four million people, empties shortly after midnight. Maj. Gen. Ali Mohsen al-Ahmar, commander of the renegade division, warned of the danger of civil war in a Monday statement in which he called on the international community to force Saleh out of office. "The madness of this man, his obsession with power, his thirst for revenge and his irresponsible behavior show that he wants to ignite a ruinous civil war that will add to the instability of the region," said al-Ahmar, a one-time Saleh ally and a veteran of all of Yemen's domestic wars in the past three decades. Saleh counters these claims by maintaining that al-Ahmar and the tribal chiefs who turned against him are outlaws who have gone against "constitutional legitimacy" and that they are thirsty for power, not reform. A statement by the al-Ahmar family, which heads Yemen's most powerful federation of tribes, said eight of its men were killed in the fighting Monday and at least 20 were wounded. The death toll was likely to rise as rescue teams search for bodies under the rubble of structures partially or completely destroyed in the fighting. Security and medical officials said four civilians caught in the crossfire were killed along with two government troops. At the city center, three people were killed and five were wounded when mortars hit a protest encampment in an intersection dubbed Change Square, the birthplace and epicenter of an eight-month-old popular campaign to topple Saleh, Yemen's leader of 33 years. Five others were wounded, according to the officials. 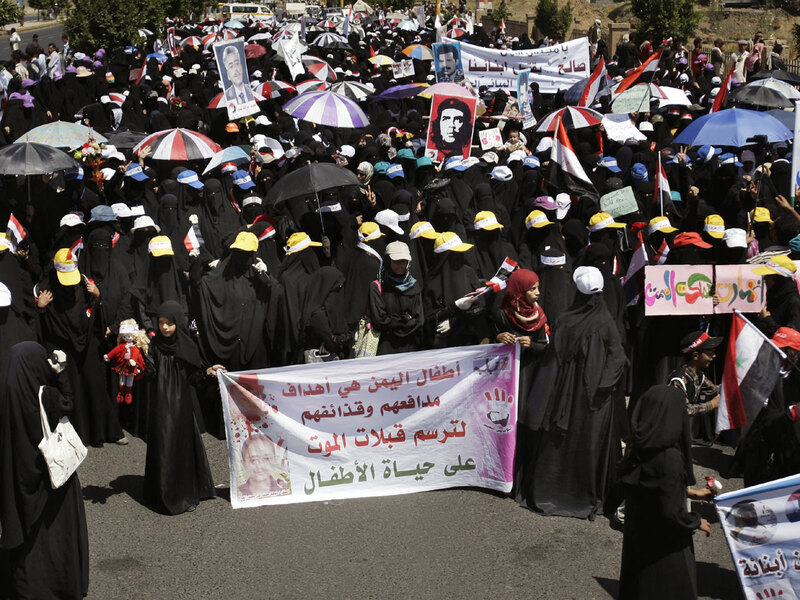 Also, a man was killed in the city of Taiz and seven were wounded when pro-regime gunmen fired on protesters. There were no casualty figures from the 1st Armored Division, but Maj-Gen. al-Ahmar said in a statement that 91 of his men were killed and 2,300 wounded in fighting between his troops and pro-regime forces since Saleh returned home from Saudi Arabia Sept. 23. Saleh was there for nearly four months to treat wounds suffered in an attack on his Sanaa compound in early June.